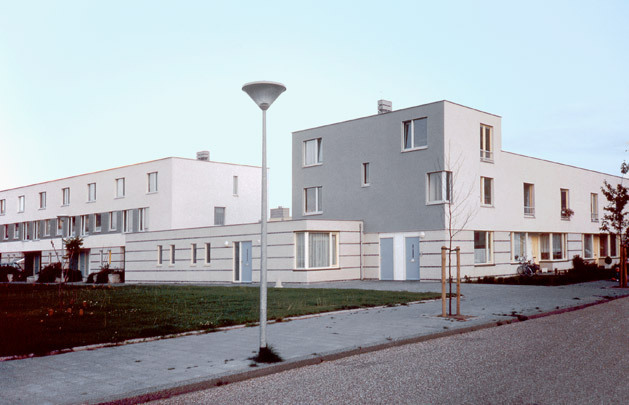 Proceeding from a broad scheme by the council, Roelf Steenhuis drew up an urban plan for this new estate on the expansive waters of Paterswoldse Meer. Various architects had their own areas to flesh out, including Steenhuis himself whose overall plan has since swelled into an icon of domestic architectural and urban quality. His work is inspired by the Modern housing of Oud, Stam and Taut, yet has nothing rigid or monotonous about it, being worked out sensitively and undogmatically with houses attuned to the dwelling environment. The complex has a simple urban structure of rectangular semi-open blocks set in an east-west alignment, enlivened by such spatial features as a quartet of lakeside villas by Pi de Bruijn, a plaza and a walking route. Attractive street profiles are achieved by such simple means as lean-to roofs and variation in building height. The area assigned to Karelse & Van der Meer and Geurst & Schulze leans heavily on the Modern tradition in both architecture and planning.